MTRWESTERN is proud to be one of the top private transportation providers in the Willamette River Valley. MTRWESTERN is proud to be one of the top private transportation providers in the Willamette River Valley. Eugene, as our southernmost hub, provides a crucial link between Seattle, Portland and cities in the Pacific Northwest, with Bend, Medford, Northern California and all of the surrounding mountain and coastal destinations. We have strong relationships with the University of Oregon, plus nearby schools including Oregon State University in Corvallis and OSU-Cascades in Bend. We’re the top athletic transportation provider in the region, serving home and visiting teams; we know the intricacies of getting players and personnel into and out of Autzen Stadium and Matthew Knight Arena with ease. Eugene is growing faster than the city’s highways can keep up, so more and more companies, conventions, military bases and tourism operators are turning to MTRWESTERN busses and shuttles as an alternative to being stuck in traffic along The Beltline, I-5 and the Delta Highway. 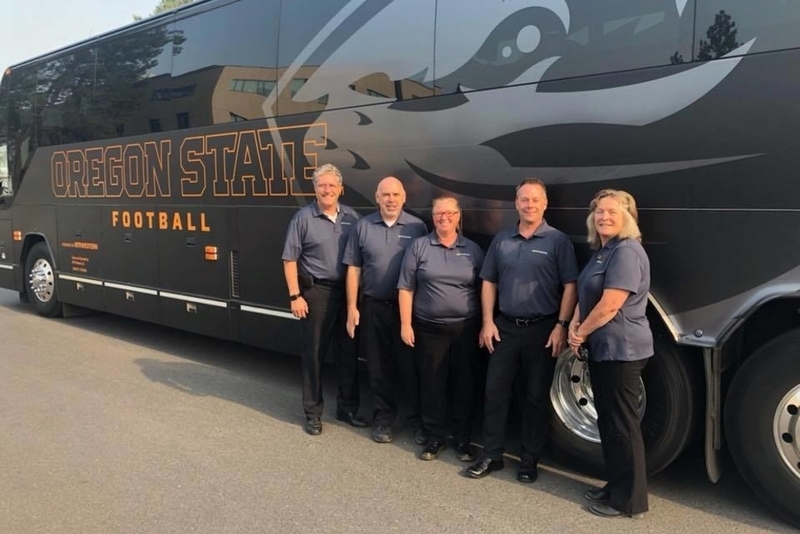 MTRWESTERN has a full fleet of charter coaches and shuttle busses at the ready, to serve customers for one-time special events as well as short- and long-term transportation solutions.